If Peter Piper picked a peck of pickled peppers, how many pickled peppers did his robot counterpart pick? Soon enough, science may have the answer. Automated farm machinery is using technological developments to expand mechanizing the farm industry in many interesting ways. As singularityhub.com reports, pepper-picking, plant-pruning, soil-testing, and crop-health-monitoring robotics are now entering the farming field. Much as industrialization occurred in factories last century, now difficult and dangerous farm jobs can soon be outsourced to mechanical farmhands. Thanks to telepresence aided by affordable sensors and computerized vision, machines like the pepper-picking WP5 robot can autonomously select and harvest ripe pepper plants. Other tools like ground-based transponders and radar (with a bit of pre-programming by driving the perimeter) can allow for self-driving tractors to tend to fields. 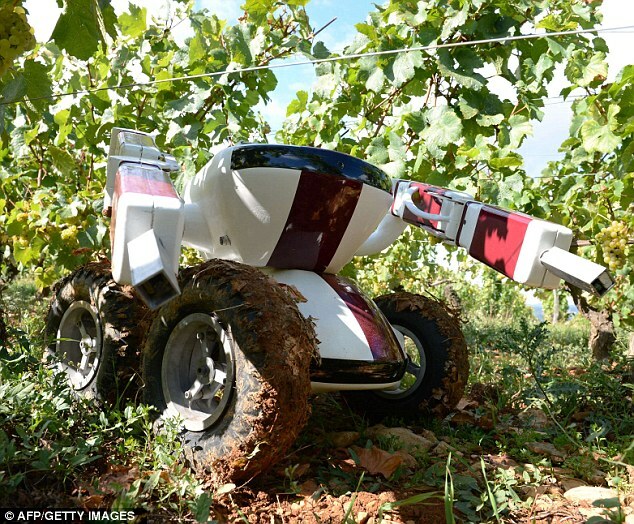 Yet another bot, the Wall-Ye, is capable of caring for vineyards by pruning vines and testing soil. Even drones are in on the action, monitoring large fields from above for irrigation problems and threats to plant health. The farms of the future may just allow humans to sit back and enjoy the fruits of the earth...as long as the robot workers haven't risen up to usurp it from us by then. Wall-Ye the wine-bot does everything except bartend. Maybe that'll be in Model 2.0.